Saying Yes to everything Fancy Girl asks for her wedding next month. I can't remember half of what I have agreed to but am sure she will remind me. It's better this way. Failing, spectacularly and continuously, to have an early night. Before Christmas I drew a huge diagram on a whiteboard with many different coloured pens to try and see where I am now, and where I want to be. It was good to see how what was in my head looked when it was out on a whiteboard. Much of it was ideas, hopes and plans. There were arrows linking the ideas to each other. It was filled with possibility. I was impressed with what I wanted to do, and what I was already doing and felt that with some help, I could rule the world. Maybe it was the act of externalising these plans and thoughts that created a magical pathway to all manner of people who woke up after Christmas with an inexplicable passion to find amongst other things, an artist, somewhere, somehow, that has painted dying people and interviewed them. Or to find someone who could talk about this Soul Midwifery lark. Someone else woke up longing to go to an interactive workshop that looked at facing one's mortality in order to understand the need to really live, and a whole host of other people began to long to sit down somewhere with some fabulous cake and chat amongst themselves about the end of life. But none of them knew how! Or where! Or who! All those little arrows and diagrams on my white board must have emitted a magical allure to these people who woke with mysterious and barely articulated desires for all the things I wanted to offer, and one thing led to another, and lo. I am busy as heck doing it all. Fabulous. And so I have re-jigged my whiteboard and have rubbed out the question marks beside the projects that had not, at that time, materialised. Now, there are bookings, and events, and confirmations, all underlined and with hefty full stops after them, signifying definiteness. I have had to buckle down and write some plans. And get my easels out and line up the paintings. And think about deadlines and what to do first. Father Dom is first. Father Dominic is my youngest brother, and a Catholic priest. His world was turned upside down by his stage four bowel cancer over a year ago, though he is now living with the treatment and the cancer and doing very well. I have started and abandoned his portrait three times now. The first time, he looked like a small Spaniard. Nothing wrong with small Spaniards, but Dom is a tall Brit. Second time, he looked like Dobbie from Harry Potter. I stopped painting him then and began to think I was not going to be able to do it. But this weekend, I decided it was time to just do it. Yesterday, Sunday, I spent a day in the studio enjoying the painting, and it has begun to form just as it should. Dominic, my youngest brother, is taking form and looking back at me. Tomorrow I am having lunch with him in his home in Dorking, and we will go over the interview I have done with him. One of the things I admire about Fr Dominic is his honesty to face his fears and the darkness when it comes. He is articulate and open, which is one of the things I want to capture for his part in the A Graceful Death exhibition. will be taking part in the Dying To Know event below. We will have the Meridian TV team with us filming Fred and the event which is a real bonus. Must remember to wear my twinkly nail varnish. This event is organised and put together by my dear friend and colleague Mandy Preece, Soul Midwife Extraordinaire, and her team. You are right in thinking there will be a good many Soul Midwives there. There will. There will be a million of us. 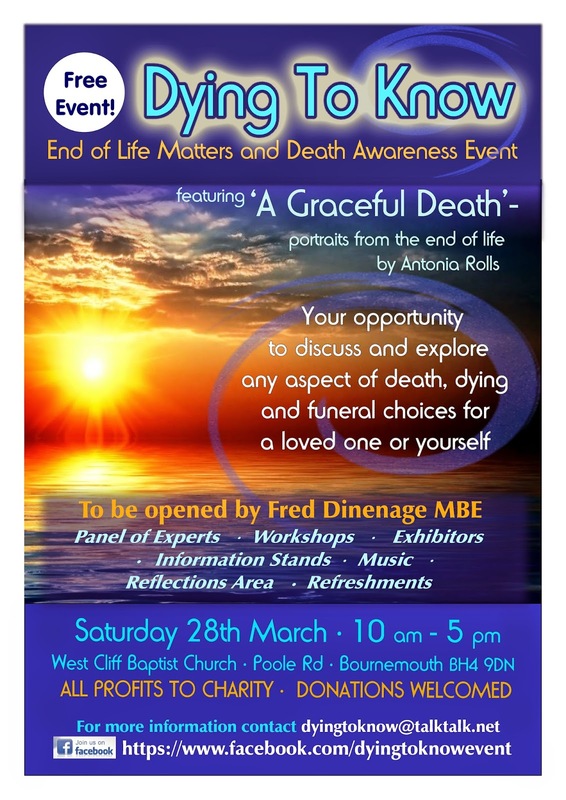 Do come, take part - meet us all, talk to us, discover new things from the many exhibitors, learn about what is available for funeral planning, end of life services, meet representatives from local hospices, and see the A Graceful Death exhibition. I will be chairing a panel of experts in the afternoon, talking and answering questions from their professional and personal points of view. And I believe Mandy has a band organised for the finale of the day. I believe too that Canon John Hyde from this church, and his team, will be providing bacon sandwiches in the morning. Why stay away? The portrait of Father Dominic Rolls will be showing for the first time at this event. Come and see him, and meet all the other sitters who have shared with us their image and story, in order that we may know what dying means to them. I am also planning a big AGD in Chichester in November. I am waiting to see if the venue I want is free. Fingers crossed. The Daisy books. I am producing illustrations for this series of books for children, and have nine paintings for the first book to do in the next few weeks. Bring it on. Jesus on the Tube. For a very nice couple who live abroad. I can do it. A painting with the twelve months painted and decorated appropriately in twelve little sections. Yes, let's do it. Fourth. Talks, Workshops and Conversations. Talks. At the Sussex Dowsing Society on 10 May, I will be talking about Soul Midwifery and A Graceful Death. This is confirmed but the publicity has yet to be done for it. Secretly, I know how to dowse. My dear old mother taught me, and she still uses it for such things from telling her if food is off in the fridge, to telling her I need an early night. When we were children Mother used to dowse everything, including us. She taught us how to do it and for a while I thought it was magic, and even used it to see which television programmes I should watch. I may get mother to dowse the venue in Chichester where I want to hold the AGD exhibition in November. Yes! she will say, and they will have to listen, or she will dowse all their secrets out of them. Workshops. My colleague Gill Lake and I are holding workshops called the Spirit of Living and Dying. These are interactive workshops from 10am to 4pm where we look at how facing our mortality can give us the key to living with passion and joy. The first one is at the Hamblin Trust in Bosham on March 14 (keep an eye out for that, they will advertise it nearer the time), and the second is at Angelica Alternative and Holistic Health in Barnham on 12 April. Here is a link to the Angelica workshop to see a bit more, and to book tickets if you would like to come. Tickets are £40 per person. 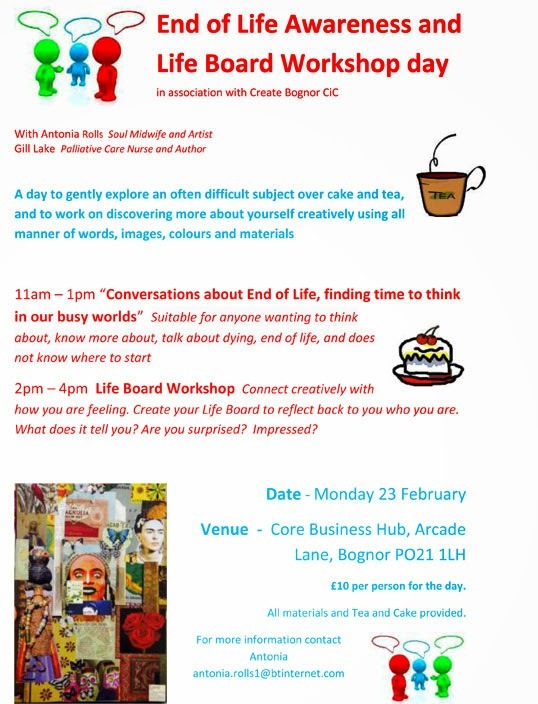 After chatting about end of life matters, it will be great to spend time expressing how you feel with a Life Board workshop. Much chatting and cutting and sticking. And Gill's cakes, worth coming to eat Gill's cakes. And the next "Conversations about the End of Life, Finding Time to Think in Our Busy World" solo session is on the 20 March at St Paul's Art Centre in Worthing from 1.30 to 4.30. Gill's bringing her cakes. You know what to do. The work that I do is all about people. It is called, in my mind, The Work. People are my work. I raise awareness about end of life and I sit with the dying, and I talk to families who are in the midst of losing someone. But it doesn't stop there. I meet people all the time, all manner of people, all of the time and with each person comes the possibility of an awareness of the finite time we have in which to live. And there is the key. In which to live. The Work is not just about talking about dying, about death, it is about choosing to live because you understand that you can. You can live, you can see your days as yours, and precious, because they are finite and your responsibility, and the fact that you will die gives you the impetus to see this life of yours as the most important and honourable gift in the entire universe. It is yours! So find your joy, and live. There are many times when I don't do what I have planned on my precious white boards, because people come my way and The Work must be done. It is so simple. Each time a small light is lit in someone's heart, that they have faced the idea of mortality and can see how their life is their job, their responsibility, something to be taken seriously and noticed, an angel smiles in Heaven, and death is not in vain. This is very important. I have just painted my toe and fingernails with twinkly nail varnish. I have had two things to do for a while and have not done them. One is the ironing, and the other is to paint my nails with glitter. I will do the ironing tomorrow. I couldn't resist the picture below. Soul Midwives arriving to the Dying to Know event in Bournemouth. Good night all, till March. 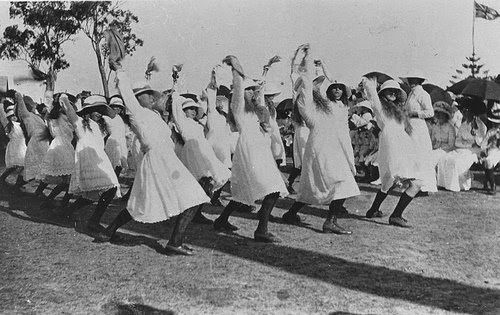 These are school girls from the 1920s who are probably smiling in Heaven and approve of this application of their innocent photo from so many years ago.